This Southern Living® design does not disappoint. 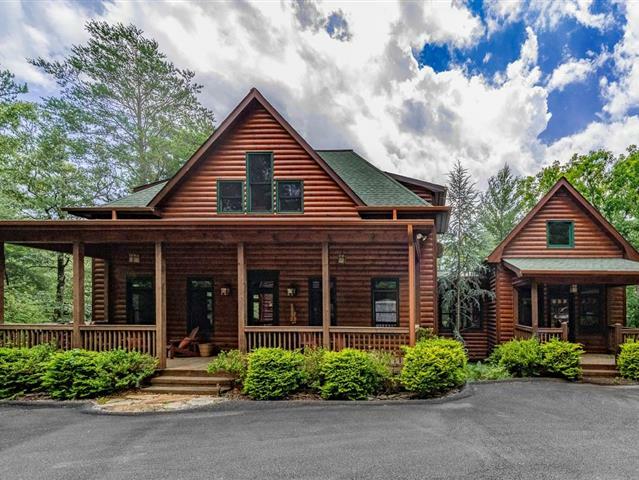 The open concept is realized in this magnificent 5 BR/5 BA cabin. Featuring a large kitchen w/lots of cabinets and counter space, and a center island w/prep sink. The master suite is your own private oasis connected to the main house via a breezeway. The master bath includes his & hers walk in closets, oversized tiled shower, claw foot tub and separate water closet. The upper floor consists of two ensuite bedrooms. The lower level continues the open concept with additional guest quarters and wet bar area. Detached 26 x 30 garage with finished apartment above and full kitchen and bedroom suite. Additional features: Rinnai tankless water heater, dual zone HVAC, washer/dryer hook ups on main and lower levels.